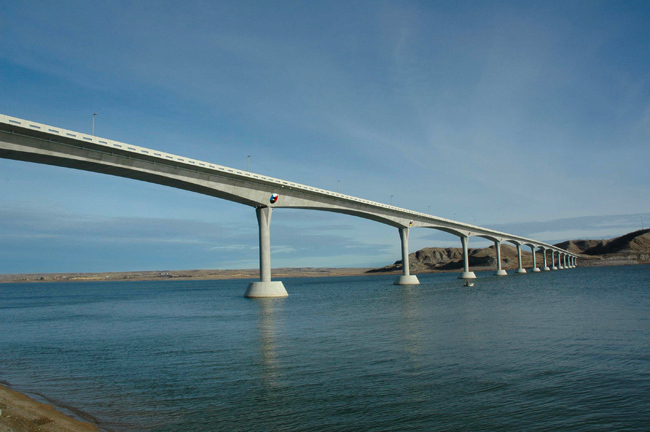 For the construction of the Four Bears Bridge, a 4,500-foot-long, segmental concrete structure that crosses Lake Sakakawea in the northwestern corner of the Fort Berthold Reservation, we were retained to provide construction engineering and testing, including dynamic pile analysis for piles with design capacities up to 400 tons. Challenges on the $45 million project included performing soil borings on the lake from a barge while advancing through 60 feet of water and 240 feet of soil. Because it was November, when the weather can be unpredictable, drilling continued 24 hours a day, six days a week, for three weeks. Test methods included standard penetration testing, flat-plate dilatometer testing and cone penetration testing. Our engineering analysis included a number of pile and drilled pier foundation solutions, with the selected system being a concrete-filled, driven steel-shell pile, 36 inches in diameter.